Millions of Americans who don’t usually follow soccer tuned in to watch the U.S. women’s team come this close to winning the World Cup. While our side lost to Japan, the takeaway for many people was that women’s soccer is every bit as competitive and engaging as the men’s game. Unlike some sports, such as basketball, where men simply have more raw physical ability than women, in soccer there’s not that much difference in the level of play between genders. “It’s the same size pitch, the same size goal, and the same size ball,” says Armstrong Atlantic State University head women’s soccer coach Eric Faulconer. Faulconer, who founded women’s soccer at AASU in 2005 and has been head coach ever since, recently took his team all the way to the NCAA Final Four before losing to St. Rose 2–0 on Dec. 1, 2011. Soccer is a game of lightning strikes, where not much happens for a long time and then a whole lot happens within the space of a few seconds. That said, the success story of Armstrong Atlantic State University women’s soccer has been one of steady, inexorable progress. “We were just in the Final Four. The year before that we made it to the round of 16. The year before that we were in the round of 32,” says the coach. What’s the secret of his success? Unlike individual sports like tennis, or small–squad sports like basketball, having one or two awesome athletes is not enough to guarantee victory. And the typically stifling nature of defensive play in soccer means there’s even more of an emphasis on team play. That said, Faulconer does allow that the AASU squad plays a robustly physical game. “We’re very athletic. We use the same 4–3–3 system Barcelona does,” he says, referring to the Spanish professional team generally considered the overall best — or at least most fun to watch — in the world. Perhaps counterintuitively, Faulconer says another advantage for AASU is that it doesn’t compete at the very highest level of collegiate play. Faulconer says AASU women’s soccer has a sizeable local following, and not just among Armstrong students. The Pirate soccer season runs from August–December, with most home games through November. What to expect when you’re expecting? The need for some nice nurturing before the baby comes — and after, too. That’s why when Ginger Veitinger first became certified as a massage therapist, she had pregnant women in mind. She opened Bump Massage Therapy last year to provide quality, educated prenatal massage to help Savannah’s mothers reduce the stress of pregnancy and help in the birth process. “The intent behind prenatal massage is to improve the gestational process not just for mom, but for the baby,” explains the mother of two, adding that intentional touch has been proven to have a positive effect on hormone levels. It also reduces the swelling and back pain associated with growing a human inside one’s body. Taking care to avoid certain pressure points and employing a variety of pillows and bolsters, she’s able to modify massage positions as her clients’ bellies grow, seeing them safely from the first trimester all the way through labor, delivery and beyond. While Veitinger treats plenty of non–pregnant women and men (she has a reputation for being a genius with neck and shoulder tweaks,) she has developed her practice around treating women for the entire childbirth year, which includes the three months after the baby is born. Post–partum care at Bump includes a posture evaluation and techniques on how to carry the new arrival without causing imbalances. Veitinger believes in the natural ability of woman’s body to have a healthy baby without unnecessary interventions. A fount of information about natural childbirth, she plans to pursue a midwifery certification in the near future. There’s a sign above Bradley Lock & Key on State Street that says “We Fix Everything But a Broken Heart,” hearkening back to the days when Dr. Paul Bradley’s father, grandfather and great–grandfather tinkered with Savannah’s shorted–out appliances. “Now they joke that I’m the one who fixes hearts,” he chuckles. 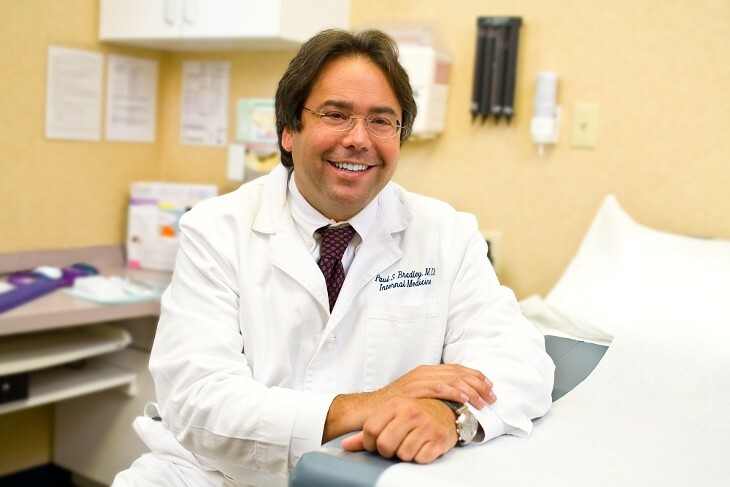 As a general practitioner, he sees patients from all walks of life with a variety of health issues, including heart disease and diabetes. But in the last decade, he realized that 15–minute visits weren’t enough to counsel people on the one condition that makes everything worse: Obesity. Wanting to provide education and care for his patients, he opened Ourlife (formerly Hourglass), a weight loss and exercise facility where he and other doctors could refer their patients to and know it was based in sound medicine. He’s developed employee–wide health programming for the City of Savannah, Gulfstream and local hospitals and gained national fame as Ruby Gettinger’s weight loss specialist on her hit TV show. Once again, Kelly Boyd and her cadre of kind instructors take the top spot with their wisdom on flexibility, strength and meditation in the sunny Bull St. location. Carol Daly-Wilder will work your core on the mat or on one the various pulleys, reformers and chair set up to strengthen and stretch the spine. Whether you're a Zumba fanatic or just want to hit the weights, your neighborhood Y is the place to work that body. Spine & Sport's secret weapon continues his reign as the go-to guy for rehab after surgery or to rid yourself of that crick in your neck. The Strong Gym owner and exercise physiologist has a sterling reputation for building strength without making anyone cry. The Savannah native also specializes in senior fitness, post-therapy rehab and cancer support. Get your ‘scrips filled by the friendly folks at CVS while picking up a bevy of other drugstore necessities, like sunscreen, earplugs and Junior Mints. Providing ahead-of-the-curve technologies and preventative care education, St. Joe's/Candler remains our readers' preferred hospital experience. The comprehensive clinic offers everything from allergy care to physical therapy at seven locations across south Georgia, even on the weekends. Everyone knows that behind any decent doctor is a crew of knowledgeable, compassionate nurses who do all the dirty work. When it comes to lady parts, Dr. Edwards has a fine reputation for kind and straight-forward care. This Certified Nurse Midwife assists in natural deliveries of babies (even at home or underwater!) as well as provides breastfeeding support. Chatham Dermatology's vociferous advocate of sunscreen keeps Savannah's skin healthy and happy. Dr. Tao knows how to stick in the needles, using Chinese medicine to bring his patients' bodies back into balance. Another win for Dr. Wetherington, who keeps backs and necks straight at his practice on Waters Avenue. How can you go wrong with a name like that? Your pearly whites are in the finest hands with this native Savannahian who's been practicing for over 25 years. Clarity is the aim of Boland Eye Center on Montgomery Cross Road, where this friendly opthalmologist brings his patients' vision into focus. Most of us can use some therapy at some point, and this downtown practice is our readers' choice for marriage, family and personal counseling. Last year's winner continues to make the grade with his careful attention to facial and body reconstruction. Furry friends to receive exceptional care with Dr. Marlay at Eastside Veterinary Hospital in Thunderbolt. Pets get star treatment, including dental care and diet counseling, at this full-service clinic in the Starland District. It's still the good ol' days on Bull Street, where Juan, Gary and the gang clip and shore their customers in the most gentlemanly manner. The sassy crew on Broughton Street takes the title once more with their up-to-the-minute cuts and kickin' style. Last year's winner keeps her clients happily coiffed at Park West Salon. Put a little flash in that ‘do with the superfly and extremely-educated Colorboxx owner. Hot rocks, extra massage and a rainbow of polish choices keep this Waters Ave. hotspot on top. The manicure maven decorates digits on Broughton Street. Owner Courtney Buntin Victor oversees a crew of medically-trained professionals who provide the latest in keep-you-gorgeous procedures. The bucolic downtown refuge offers pampering from follicle to toes with traditional and organic spa treatments. A perfect sun-kissed glow is available all year long at two clean and relaxing locations in Savannah and Statesboro. Savannah's favorite spot to stud the body also offers a hot selection of quality jewelry and clothing. Chris and Brooke Autry continue to up the ante for fine ink at their happening Victory Drive location. Seasoned pros and weekend warriors suit up in style on Broughton. With gorgeous views and a top-notch pro shop, this championship course across the river is a favorite no matter what the handicap. It's nothing but love-love for the city-run, taxpayer-funded hard courts just off Skidaway. The gigantic fun factory in Pooler knocks down the competition with 28 lanes, plus laser tag and a kickin' video arcade. The living stays easy on Turner's Creek, where boaters can find everything they need for a day out on the water. From jogging the perimeter to climbing the monkey bars to picnicking in the sun, Savannah's long green common area remains your go-to spot for outdoor fun. Whether you follow the 1-mile Sandpiper Nature Trail or brave the 3-mile Big Ferry Loop through the marshes and live oaks, this is the place to spot local wildlife. The boys in gray do us proud every season as they take on the rest of their Sally League competition at historic Grayson Stadium and on the road. This bruising posse of wheeled dervishes continues to rock the Civic Center with their high-scoring jams and tenacious badassery. All hail the Class-A State Football Champions! The Raiders beat Fairburn, GA's Landmark Christian 20-3 in December for the school's first GHSA title. Seems like the inaugural event had the whole city running in the streets and on part of the Truman Parkway; now we see those 26.2 and 13.1 stickers everywhere. The next one is November 3: Have you started training yet? The professional golfer got his debut at the Players Championship last week after another player tweaked his back. He lives in Sea Island.